What Are keywords? Keywords are simply the words you use as part of your web page content. But as you can imagine, some words are always more important than others. You could say that keywords are the important words in your web page copy. Why Are Keywords Important? Keywords are important because that is what allows your customers to find your web page when they search the Internet. Put another way, keywords are important because they bring targeted traffic to your web pages. Get Rid Of Unwanted Clicks With Keyword Management One of the best ways to get manage your traffic quality is by focusing on keyword selection. By selecting the right keywords you can reduce the number of untargeted clicks you get, reducing your costs. But it doesn’t stop there. Eliminating unwanted clicks increases the click-through rates for your ad groups, leading to higher quality scores, lower CPCs, and increased conversions The first step in keyword management is to search for high-traffic keywords that get no conversions. By removing keywords that drive untargeted traffic you can free up dollars to spend on existing terms that perform well or buy traffic on completely new terms. When it comes to search marketing, keyword research is typically associated with search engine optimization (SEO), while bid management is associated with pay-per-click (PPC) marketing. But you rarely hear marketers talk about keyword management: a step between finding new keywords and managing bids in your AdWords account. 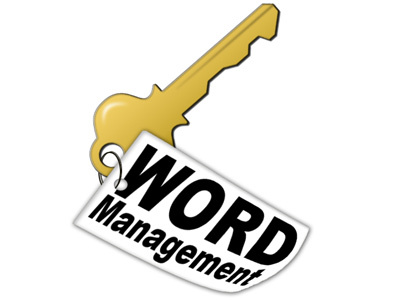 This is interesting when you consider that keywordmanagement–the act of organizing and refining your keywords before you take action–is arguably the most important and yet the most overlooked aspect in all of PPC and SEO marketing.